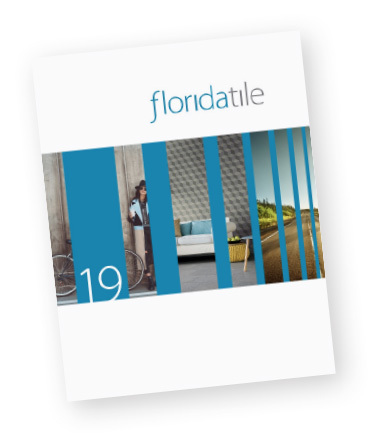 Level 10HDP by Florida Tile is the new benchmark HDP–High Definition Porcelain® line inspired by the cool modern aesthetics of a stained concrete. Not content as a simple one-dimensional look, we have taken the concrete styling and combined it with other natural elements. Incorporating signs of distress, we are able to add character that brings the collection to life. With worn in staining, watermarks and chips, the concrete look becomes more familiar and engaging. Lending a hand in the design are organic elements commonly found in natural stone; fill marks, sediment, pits and veining. The color palette is made up of 3 warm tones, a white, beige and bronze with a fourth color that lends itself a cool blue undertone in a light grey. The Level 10HDP collection comes in three large formats 12x24, 18x18 and 18x36 (rectified) and features creative patterned decorative inserts and listellos in coordinating warm and cool versions, as well as M12 mosaics, bullnose and a full cove base package in each of the 4 colors. This product line, with the exception of select trim, decorative pieces, is Made in the USA of 40% pre-consumer recycled content, is GREENGUARD®, Green Squared® and Porcelain Tile Certified.